Winter weather can create all sorts of problems for your home, many of which are caused by ice buildups. Ice dams can ruin your gutters, hail can shatter windows, and frozen pipes can become a plumbing nightmare. Of these, frozen pipes often prove the biggest surprise to homeowners because the pipes are located either underground or inside the home, protected from the outside cold. Understanding the factors that cause your pipes to freeze and taking some simple preventative steps can help you avoid a costly breakage from occurring. When the weather is cold enough, a pipe can freeze in one of two ways. As water in the pipe freezes, it expands and creates pressure inside the pipe. This buildup may occur from a high volume of water pressing against the pipe’s interior. It may also happen when a smaller amount of water freezes and blocks the pipeline, causing a buildup of pressure when water becomes confined within the line. At What Temperature Do Pipes Freeze? According to a 2006 study performed by the Building Research Council (BRC) at the University of Illinois, non-insulated pipes may begin to freeze when the weather drops to 20 degrees Fahrenheit or below. The freezing temperature for water is actually 32 degrees, but building materials or ground surrounding the pipe provide a small degree of insulation. 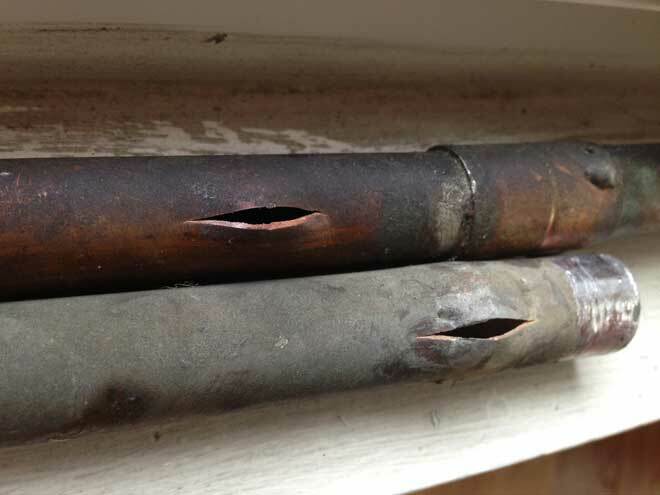 The single biggest risk from frozen pipes is a burst line. Whether it is caused by the ice itself or by highly pressurized liquid water, a burst pipe can be costly to replace and may cause extensive water damage to the area around the break. According to the Insurance Institute for Property Loss Reduction (IIPLR), more than four billion dollars’ worth of damage due to burst pipes was estimated for the decade prior to the BRC report. There are two warning signs of a frozen pipe. The first is greatly reduced water pressure, often resulting in a trickle or only drops coming from a faucet. A more serious sign is that of water damage caused by a burst pipe. Thankfully, locating a frozen pipe and treating it is less difficult than handling the aftermath of burst pipes. To narrow down the possible location of your frozen pipe, shut off all taps in the house. Test them one at a time and make a note of which ones lack pressure. A single affected tap means the frozen pipe is isolated and easier to address. Widespread problems suggest that there is either a single pipe frozen near where water enters your home, or there are numerous affected pipes. Be sure to leave any badly affected taps open to avoid pressure buildup and aid in thawing. Check the suspected area for pipes that lack insulation or are extra cold to the touch. Pipes enclosed in cabinets under a sink are also known to freeze faster due to having less exposure to the room’s warmth. In the event you are unable to locate the frozen section or believe there to be multiple sources, you may wish to contact a plumber. Hot towels may be wrapped around the pipe and exchanged every three to five minutes. Be sure to wear protective gloves when handling the towels to avoid burns. If the water flows at a trickle, leave the tap on and allow the moving water to slowly melt the ice. Use space heaters near the frozen pipes, enclosing the space with tarps if necessary. Make sure the heater does not touch the pipe or tarp. Wrap electrical heat tape around the pipe in a spiral, being careful to prevent overlap. You may then plug the tape in and allow it to warm the pipe. You can thaw a frozen drain by pouring some table salt in and running cool to warm water. Be careful not to make the water too hot at first, or you may burst the pipe. Unfortunately, wall pipes often require you to cut a hole into the wall to access them. Before performing such a task, there are two tricks that may help thaw the pipe enough to allow water flow to do the rest. Locate outside vents and use heaters to blow warm air into the home. This is usually impractical, and a cardboard box or other battier will be needed to reduce heat loss during the process. Raise your thermostat to between 75 and 80 degrees house-wide for two to three hours. This may help to thaw the pipes in walls and floors. In the event neither of these tricks have managed to improve the water flow in the affected taps, you will need to cut into the wall where you believe the frozen pipe is. You will then be able to thaw the pipe directly and use preventative measures to avoid future freezing. Thawing out an ice buildup within an underground line can be the most frustrating. For most cases, a plumber will want to excavate the line. In the event the frozen line is a sewage line, contacting a plumber is the best option. Any cracks in that line caused by pressure and thawing could result in contaminating the surrounding soil. There is one method which has proven useful for clearing a supply line. However, this should not be attempted unless you have some prior experience with plumbing. It is also advisable to clear your project with the water company before starting. You will need a pond pump, gate valve, large Tupperware storage bin, and 125 feet of 1.4-inch nylon hose. Fill the storage bin with five gallons of water (the temperature of the water isn’t important). Unhook the water meter to get access to the supply pipe. Place the bin under the supply line’s opening. Attach the valve to the supply line. Fifty pounds or more of water pressure will be flowing through when the blockage is removed, so you will want to be able to stop the flow. If there is an existing valve which you are able to run the nylon tubing through, this step will not be necessary. Use the pump to send water through the nylon hose and insert the hose into the supply line, feeding it until you reach a blockage. Work the tube back and forth until the water melts the blockage. Continue feeding and working the blockages until the last blockage breaks and the water supply begins flowing. Shut off the valve and reconnect the meter before opening the valve again to minimize water loss. Cover any exterior faucets to reduce exposure to cold air. Keep taps in problem areas running at a small trickle to reduce the risk of freezing. Note that this method will increase your water bill. Use heat lamps or space heaters in trouble areas during cold weather, being careful not to let them come into contact with anything flammable. Wrap the pipe in pipe sponge or other insulating material. Wrap electrical heat tape around the pipe in a spiral, avoiding overlap. Plug in during cold weather, making sure the tape does not come into contact with anything heat-sensitive. Unfortunately, there is no easy way to prevent underground pipes from freezing beyond excavating and adding additional insulation or making sure they are below the property’s frost line. There will be times when the first sign of a frozen pipe is after it bursts. This will require you to clean up any water and replace the damaged section of pipe. Pay close attention to whether it was a hot, cold, or sewage pipe that burst and take appropriate precautions when tackling the problem. HGTV provides a useful guide on replacing a burst frozen pipe. Note that repairing a pipe which has frozen and burst should always be accompanied by adding preventative measures. In the event the burst pipe is underground, you will need to contact a professional plumber. This may also be the case for pipes which burst inside your walls or floors, as such repairs often require a higher level of experience and skill than casual DIYers possess. Can You Use Latex Paint over an Oil Based Primer? Can You Paint Roof Shingles? Are Gutters Necessary for Your Home? Are Freon Leaks in Your Home Dangerous?